Columbus Grove’s Rylee Sybert drives against Allen East’s Ally Richardson during Thursday night’s Northwest Conference game at Allen East. Columbus Grove’s Rylee Sybert puts up a shot against Allen East’s Tori Newland during Thursday night’s Northwest Conference game at Allen East. HARROD — Like most teams, Allen East did not want to get into a track meet with Columbus Grove. 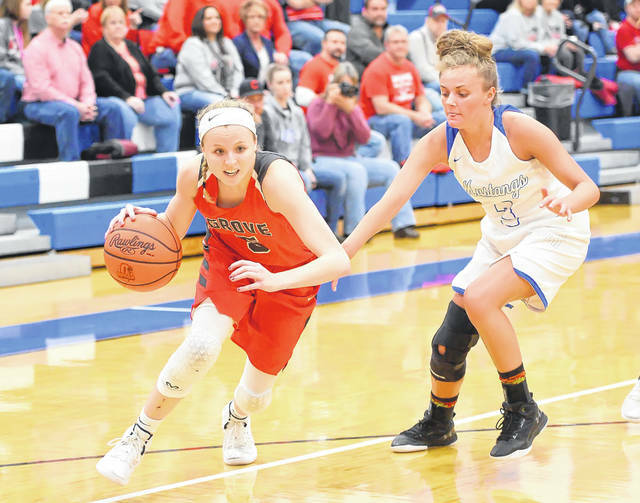 Unfortunately for Allen East, visiting Columbus Grove got out to the races in a hurry and led from start to finish, en route to a 50-38 victory over Allen East in a key Northwest Conference girls’ basketball game Thursday night. With the win, Columbus Grove stays in the hunt in the NWC race at 5-1, and is 13-5 overall. Allen East slips to 12-6 overall and 4-3 in conference play. Coming into Thursday night, Bluffton, Spencerville and Columbus Grove each had one conference loss. Spencerville (6-1 NWC) defeated Delphos Jefferson 56-37 and Bluffton (5-1 NWC) topped LCC 45-26 in a non-conference encounter. Ironically, it was a track standout leading the fast-pace Columbus Grove squad Thursday night. 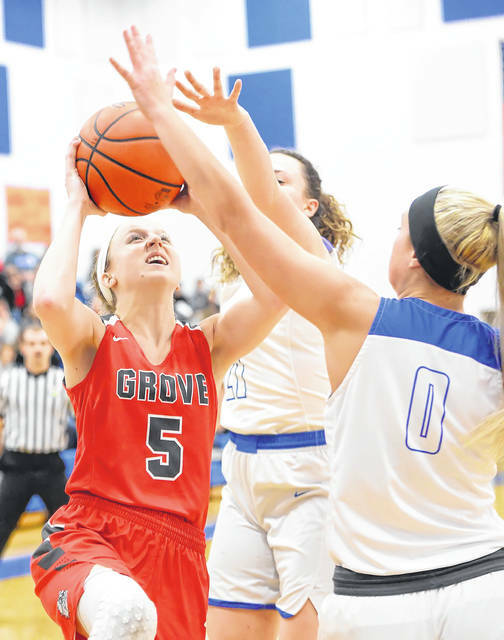 Rylee Sybert – who will compete in track next school year at the University of Findlay – led Columbus Grove and all scorers with 17 points, including two 3-pointers. The 5-foot-8 Sybert also dished out four assists and made four steals. Angel Schneider scored 11 points, pulled down nine boards, made two steals and had two blocks. Kenzie King and Abby Gladwell each had eight points for the Bulldogs. Ally Richardson led Allen East with 10 points, including two 3-pointers. Tori Newland had nine points and six rebounds for the Mustangs. The Bulldogs jumped out quickly and were never seriously challenged. Leading the way for Columbus Grove was Sybert, who pushed the pace at her guard spot. Columbus Grove’s defensive pressure helped cause 24 Allen East turnovers, which paved the way for many scores off transition for the Bulldogs. Columbus Grove pushed out to a 17-11 advantage by the end of the first quarter. Columbus Grove shot well from the perimeter in the first eight minutes of action. The Bulldogs connected on 6 of 11 shots from the floor. King hit two 3-pointers, while Sybert connected once behind the arc. Columbus Grove continued to push the tempo in the second quarter. The Bulldogs got out in transition often, as they extended their lead to 36-18 by the halftime break. Columbus Grove’s pressure helped cause seven second-quarter Allen East turnovers (13 for the half). Sybert led the way for the Bulldogs in the first half, scoring 15 points and dishing out three assists. The Bulldogs were 15 of 28 shooting in the first half. Allen East was limited to 7 of 16 shooting from the floor. “We have two pretty good post players,” Koontz said. “But when they have to come out front and guard, it puts pressure on them and it puts pressure on us. Columbus Grove led 46-31 by the third stop. Allen East turned the ball over eight more times in the third stanza, while Columbus Grove coughed it up seven times. “In the first half, I thought we played pretty sound,” Schroeder said. “Defensively, we were in better spots. I thought our rotations were a little bit cleaner. And offensively, we were actually making shots. Allen East actually out-scored Columbus Grove in the second half, 20-14. Columbus Grove turned it over 17 times, including 10 times in second half. For the game, Columbus Grove shot 47 percent from the field. Allen East connected on 37 percent of its field goal attempts. The Bulldogs held the slight edge on the boards, 24-21. This entry was tagged alleneast, columbusgrove. Bookmark the permalink.